Bushnell 732632S Trophy 2-6x32 Multi-X Reticle Riflescope 732632S FREE SHIPPING! The Bushnell Trophy 2-6x32 is a variable power riflescope designed to provide exceptional hunting performance without a premium pricetag. It features advanced Amber-Bright optical coatings that maximize light transmission while also enhancing contrast, making it easier to pick out a camouflaged target against its backdrop. Its fast-focus eyepiece and fingertip-adjustable windage and elevation controls allow you to engage your target rapidly and accurately, even when making a complex shot. The one-piece silver-colored tube is built to resist shocks effectively, and features a nitrogen fill for total water and fogproofing. 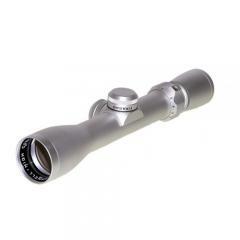 ©2002-2019 CopsPlus.com: Bushnell 732632S Trophy 2-6x32 Multi-X Reticle Riflescope 732632S FREE SHIPPING!